You love podcasts but your friends and family have no idea what they are or how to listen to them. It’s aggravating because you know they’ll love them. 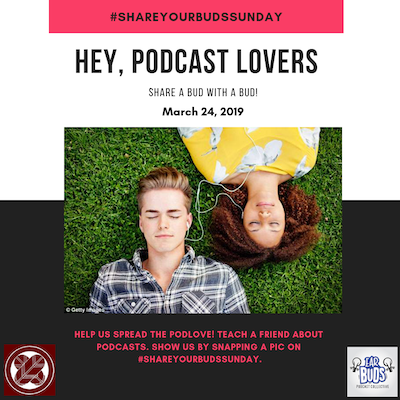 So, EarBuds Podcast Collective and Podcast Gumbo have designated Sunday, March 24, 2019 as #ShareYourBudsSunday. Download a podcast app to their mobile device and subscribe to a show. Download a great episode you’ll know they’ll love and listen to it together. Show them how to search for podcasts within the app. If listening on a computer is their preference, find a podcast’s website and play one of the episodes for them. If they love it, bookmark it. Here is a list of some common apps. The Apple Podcasts and Google Podcasts apps may already be loaded on their phones. Have fun with it. They’re your friends and family after all! Do they like watching crime shows? Listen to this episode of Criminal in your car. Overwhelmed by bad news? Have a Kind World dinner listening party for several friends. Do they have kids? Tell them they can have someone else explain how babies are made from But Why, A Podcast for Curious Kids. Is someone going to the prom this year? Have some fun listening to this story from Time Well Spent. Part 1 and Part 2. Going to wedding (or a frat party)? Impress your friends with the crazy history behind the song, Louie Louie. While you’re listening together, take a photo and share it on your favorite social media platform using the #ShareYourBudsSunday hashtag. Can you do better than these two people? Follow us on Twitter (EarBuds and Podcast Gumbo) for things to share and retweet about the big event. To use the image above, please download it here. Use bit.ly/podsunday to link to this page to save those other characters for the good stuff. If you’re a podcaster and want to help promote this day, please see below. If you’re someone in the industry, please feel free to contact me. We would love to have you help us spread the word. Below is suggestive text to read on your show and share in your show notes. Feel free to change for your audience. On March 24th, it’s hashtag #ShareYourBudsSunday. Help your friends discover podcasts by listening to a great episode together. Take a fun photo together and share it online with the hashtag, #ShareYourBudsSunday. Share your buds with a bud! More details in the show notes of this episode. On March 24th, it’s #ShareYourBudsSunday. Show a friend how to listen to a podcast and share a great podcast with them. For more information on #ShareYourBudsSunday, go to bit.ly/podsunday.